203 & 201 E. Austin St.
Extended hours during Antique Festival and other special events. In today’s work-a-day world, one can only occasionally find that place that takes you back to the adventuresome memories of your childhood, that place where you could explore and discover best kept secrets, that place where there was time to play hard then stop, lie back and watch the clouds drift by in a blue sky. Remember? No rushing cars, no incessant noise – just trees, sunshine, and time to enjoy. Nestled in the heart of Texas, in the small town of Round Top, you will find just such a place along with world class artwork on display at The Gallery at Round Top. Housed in an old barn, the gallery invites the visitor to wander in and leisurely enjoy the artwork. A bit of music, the sound of flowing water, and an array of colors fill the space. The friendly staff invites you to sit and stay awhile. Relax and take in the colors and textures of masterfully executed artwork. 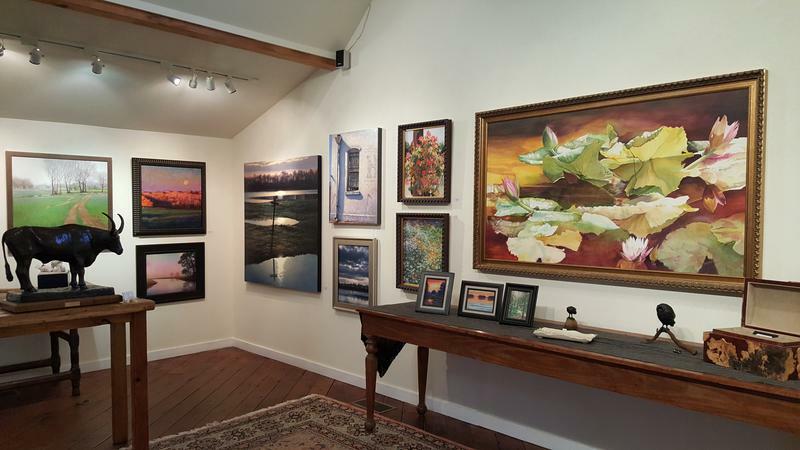 The Gallery at Round Top offers you the opportunity to experience the journey that art brings to the soul. And while you are there, visit Comforts, a division of The Gallery at Round Top. In Comforts you will find “all the comforts of home.” From beautifully handcrafted pillows, door knockers, wall decor, stoneware, and scents for the home to handbags, jewelry and scarves, here you will find an array of gifts and collectibles in the historical Ima Hogg country home built in the late 1800’s. The gallery is located in the center of Bybee Square, Round Top’s center for fine art and collectibles. Tucked in the center of the square, the gallery is surrounded by other shops offering fine crafts, jewelry, clothing, and fine wines.